Today I traveled Boston, Massachusetts via the Boston Commercial Gazette, January 16, 1817. There I found that a change was being made that would be an on-going occurrence every fourth of July… sometimes. It was the new flag design! 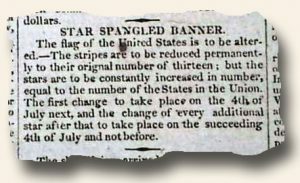 The Star Spangled Banner — “The stripes are to be reduced permanently to their original number of thirteen; but the stars are to be constantly increased in number, equal to the number of the States in the Union. The first change to take place on the 4th of July next, and the change of every additional star after that to take place on the succeeding 4th of July…”. Let the flag continue to fly, free and proud!